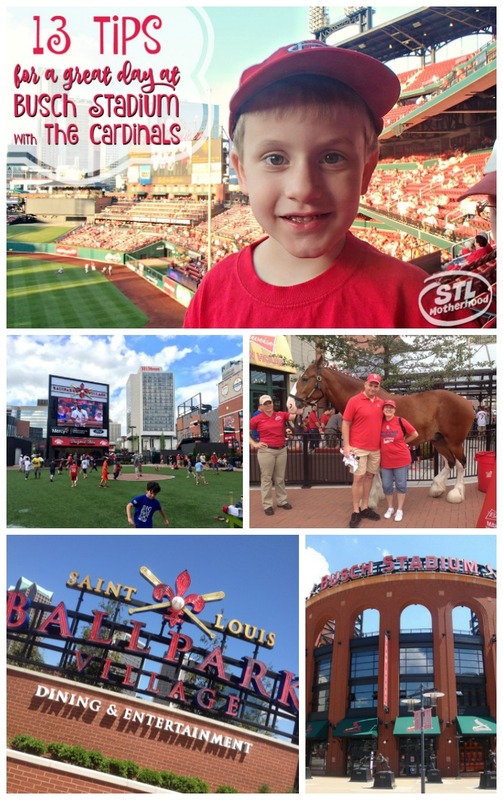 St. Louis is a huge a baseball town and taking your kids to a Cardinal’s game is a veritable rite of childhood passage. Unfortunately, if you don’t plan ahead, a trip to the ballpark can also be expensive, hot and boring for little kids! We’ve been to quite a few games and watched the Cards play from seats all over Busch Stadium. 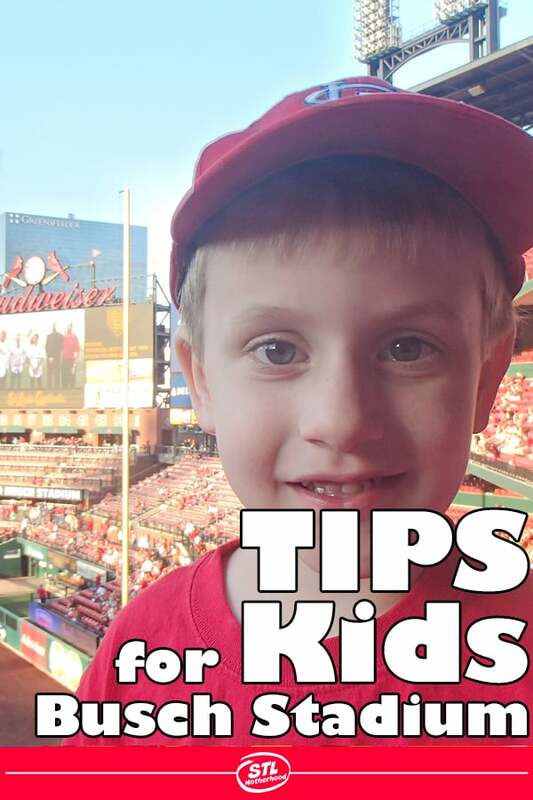 Avoid all the trouble and follow these tips for a GREAT trip to the ballpark! Use the Cardinal’s 3D seating chart or Seat Geek’s Interactive seating chart to assist your search for the perfect seats. Find out if the section is shady, in full sun or has a good view of the field. Seat Geek’s site is fun to look at–it features user submitted photos from the sections! Either way, you can buy your tickets right from the chart (and Seat Geek is pretty cheap). Busch Stadium uses a system called “dynamic pricing” where tickets prices go up or down based on demand, the weather and how good the team is doing. If you’re more interested in the experience than seeing a big time rival, check it out. Right now you can find tickets for $5! Pick your Parking. Ok, I’m not gonna lie. I like to splurge for parking. I hate having to wander around looking for a parking space downtown, so I prefer to fork over the big bucks for stadium parking. Plus, it’s a shorter walk if you’re taking little ones with you. Please don’t worry about safety when visiting downtown–I know you’ve heard stories. The truth is, millions of fans have no trouble getting in an out of the ball game–just use your common sense. If you’re planning ahead, you can even reserve a parking spot at Ball Park Village here. Save some dough on food. I might pay for a good parking spot, but I’m not willing to fork over my life savings for soda and popcorn. 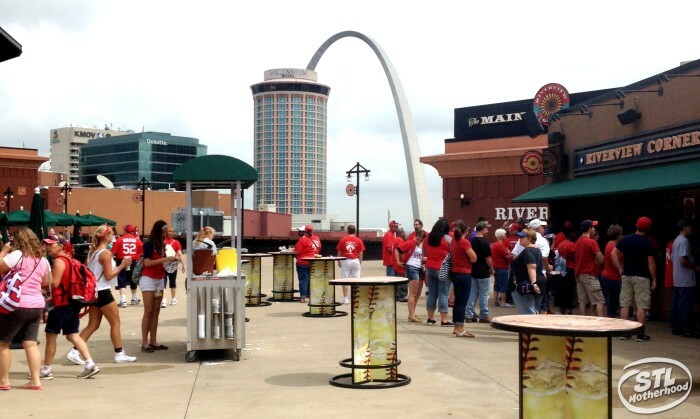 Busch Stadium allows you to bring in your own food and drink, but you have to follow the rules! First, no outside alcohol! You can bring non-alcoholic beverages in clear plastic bottles up to 2 litters in a SOFT sided cooler. And you can’t pack a picnic if you’re staying in a fancy suite, but if you can afford that you don’t need the cooler, do you? I like to pack a soft cooler full of juice pouches and small plastic soda bottles. You can freeze a bottled water to keep things cool–then drink it too after it melts! Then pack candy or healthy treats (depending on your mood and parenting style) in the cooler or your purse. Bring a bag. Thankfully the MLB people aren’t as crazy as the NFL, so you’re still allowed to bring in your regular purse or even a backpack. Just make sure it’s under 16x16x8. And it will get searched. You can score a free soda before the first inning if you sign up as a Budweiser Good Sport Designated Driver! You can sign up at kiosks next to Guest Relations on Level 1 or Level 4, and if you’re one of the first 40 to sign up you’ll get a free key chain. They also might be handing out prizes or recognize you on the message board. Of course, this is for people over 21. Check the promotions! The Cardinals love their fans, and they give away free stuff at a lot of games. Check the schedule and see what they’re offering, from t-shirts and bobble heads to fridge magnets! Just make sure you get to the game early, promotions are often limited to the first 30,000 (or less). Check out the Fan Value Corner to see when you can get free ice cream or free hot dogs or just super cheap tickets! Theme Nights are also found on the promotion’s page…maybe you want to see a game on Star Wars Night, American Girl night (get a jersey for your doll) or on Peanut Allergy Night (peanut free section). Family Pavilion Fun. The Family Pavilion is located on Level 1 between Gates 5 and 6, on the northeast corner of Busch Stadium. It’s open before and during the game, just show your ticket to get in. There’s a fee for some of the game and activities, but if you’re dealing with bored kids, it’s worth the detraction! There’s a batting cage, speed pitch, t-ball cage, soft play area and Xbox game area. 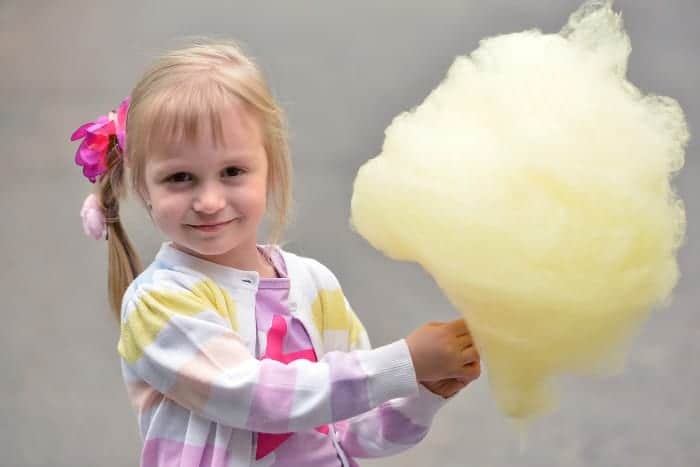 If your kids are getting antsy, why not take them for a stroll to the Family Pavilion? Don’t be like that family that sat behind me and kicked my seat for three innings. Yuck! Free “first game” certificate. Head over to the Cardinal’s website for a downloadable certificate. Build a Bird. Locally owned Build-a-Bear Workshop has a store in Busch Stadium’s Ford Plaza. It’s open two hours before the game, and during the game (but NOT after). You can build a Fredbird or pick up a jersey for a doll you already own. On July 24 they’re giving away a free bear to the first 15,000 kids under 15…with a ticket of course. Join the Club. 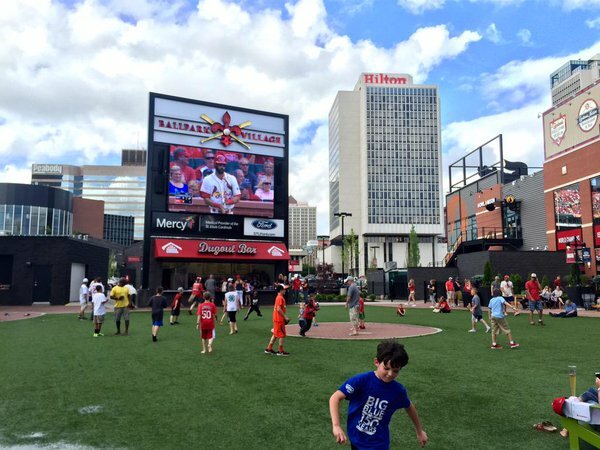 The Cardinals offers a kids clubs! The Kid’s Club is for kids under 13 and costs $30, but they include tickets, discounts and free swag. Your kid will get a ticket voucher worth $40 for 2 tickets, you choose the dates! There’s also a party day, which includes MORE tickets and fun perks, like visiting the field. You can sign up for membership online or at the stadium at the Family Pavilion and Ford Plaza. The stadium made a few updates in 2018. 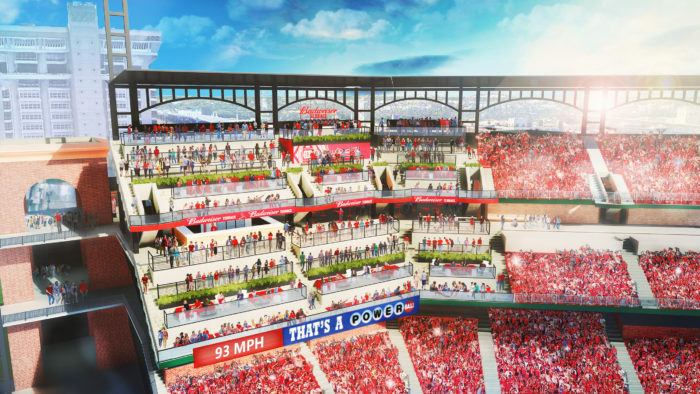 The biggest is required tearing out a little used section of the upper decks and installing the “Budweiser Terrace” where you can find $5 beers before the first pitch, or flame grilled food during the game. There’s no special tickets for this area, so if your kid needs to stretch their legs, you can wander over there, grab a snack, sit on a picnic bench and still watch the game.